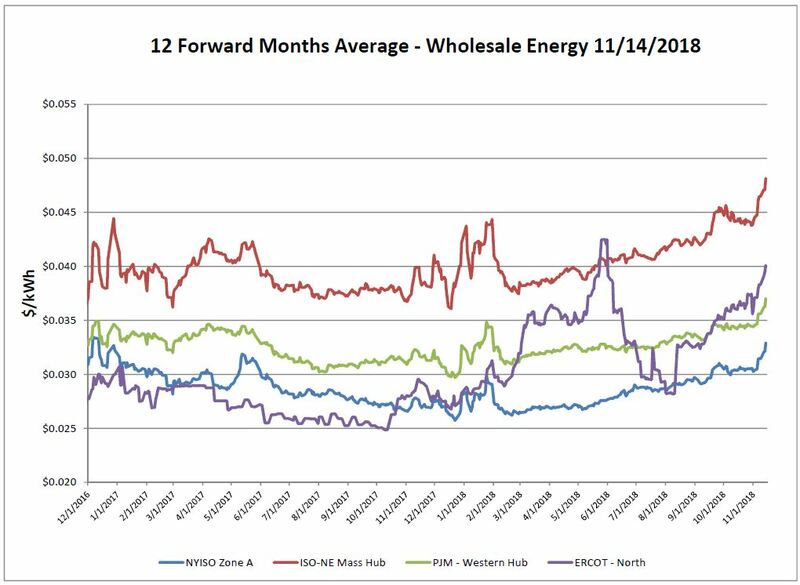 This graph depicts the average of the forward 12 months of electric pricing in each region. Over the report week there was another large increase in each ISO as a result of panic in the natural gas markets. 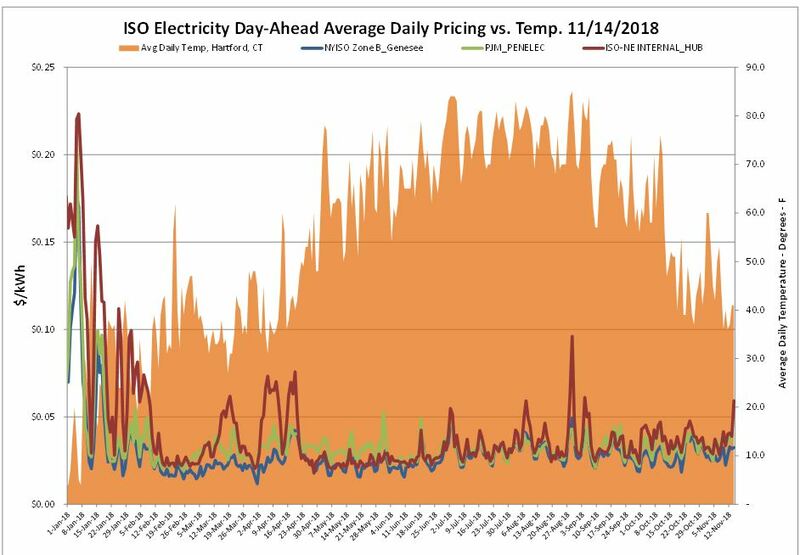 Day-ahead electric market was also up as a result of the colder than normal November temperatures and driven by forward gas prices. 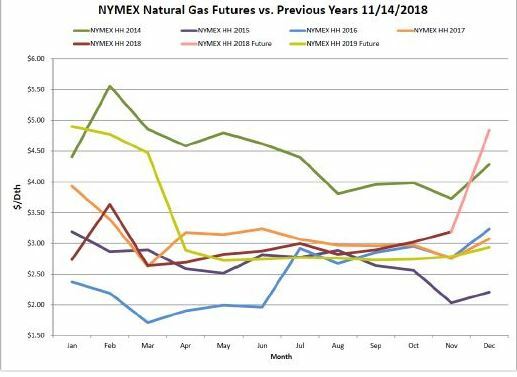 Over the report week futures for December ’18 had been extremely volatile, up as much as 20 percent in a panic for a weekly high of $4.837/Dth. This is the highest price for a prompt month contract since February 2014, which was an unseasonably cold winter with low inventory levels. The price of the 12-month strip (averaging December 2018 through November 2019) climbed 45 cents. Prices were supported by near-term weather outlooks, winter forecast uncertainty and no sign of storage recovery. Regardless of high production, demand has continued to exceed supply. Getting gas where it is needed is also a problem. Volatility and uncertainty has remained consistent. There is still time in the next few weeks for things to materialize as December’18 has not closed yet. However, storage has no chance to recover and there is no unseasonably warm weather in the forecast. Prices for next winter have remained quiet despite the near-term volatility. Next December ‘19 has actually gone down. If you are already locked in for this upcoming winter, this price spike can provide warning of how sudden and high prices can go. These types of situations highlight the risks of being on a variable/index rate. The EIA reported a net increase of 39 Bcf from the previous week. 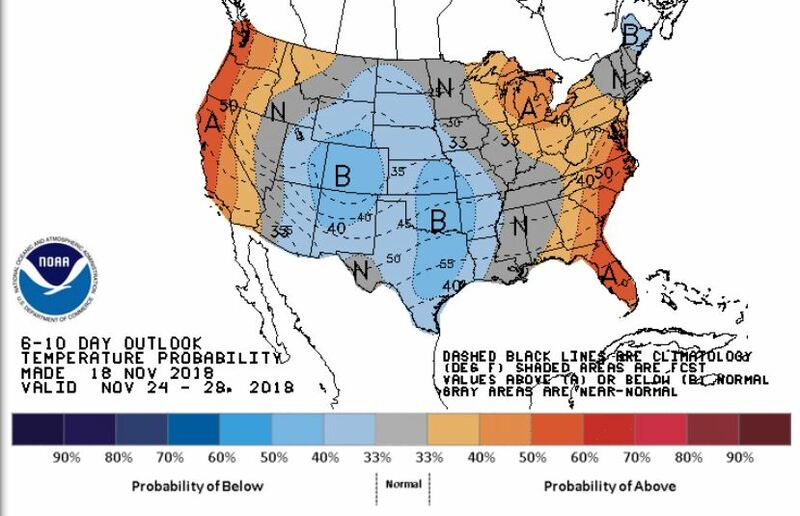 Keep in mind this injection reported for the week ending November 9th, prior to the below normal weather. Therefore, next week’s expectation for withdrawal could be looming around 100+ Bcf. 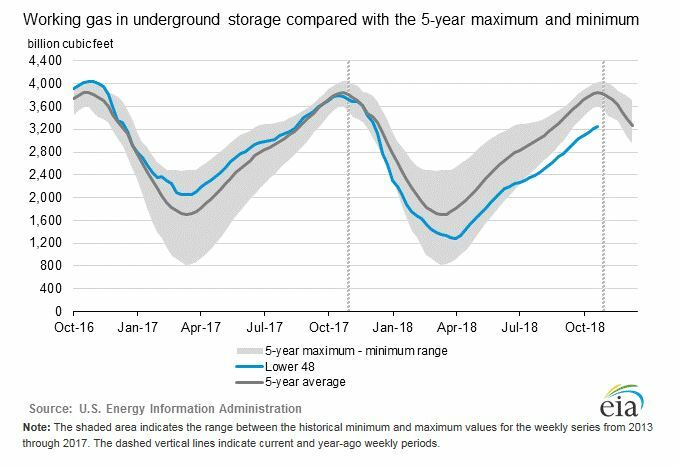 Working gas in storage was 3,247 Bcf as of Friday, November 9, 2018. 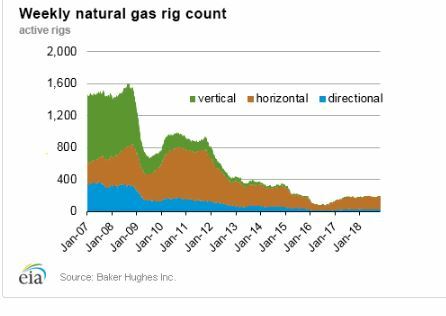 The Baker Hughes exploration gas rig count decreased by 1 rig week over week for a total of 194 rigs. This is 17 more rigs than were in operation at this time one year ago when there were 177 rigs. Weather forecasts for the end of November appear to be less extreme. The east and west coasts may see some slightly above normal temperatures, while the middle of the CONUS may experience weather that is a little cooler than normal.